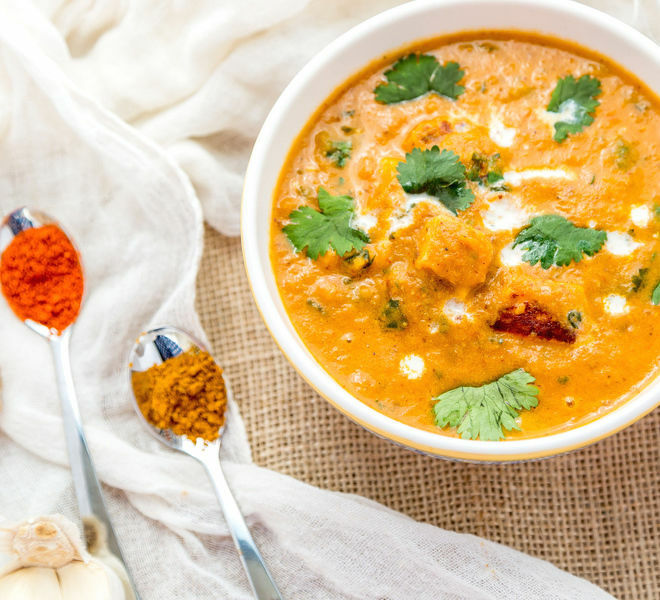 Paneer Tikka Masala is a popular Indian curry where marinated pieces of paneer are simmered in a tomato based creamy curry. This dish goes extremely well with naan or paratha! You know the most famous Indian food in the world? It’s Chicken Tikka Masala, at least that’s what I have read. You talk to anyone in UK, USA even if they wouldn’t know much about Indian food they would definitely know about chicken tikka masala. I think the dish is synonyms with Indian food in the west. But why am I talking about chicken, I am a vegetarian and so this recipe is for paneer tikka masala and not chicken. 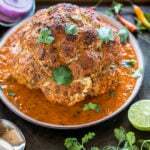 But chicken lovers can just replace paneer with chicken in this recipe and follow rest of the steps as it is. 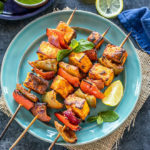 There are two parts to this recipe – the paneer tikka and the masala, which is the curry part of it. For making paneer tikka, we marinate the paneer pieces with yogurt and some spices and then pan roast them before putting them in the curry. For the masala, onions and tomatoes are cooked and then pureed. The paneer pieces are finally added to the masala and served hot! This Paneer Tikka Masala is so creamy & so good! This particular recipe I saw on TV few years back while watching Masterchef India. I noted down the recipe but never got around making it, not until today. The recipe by Chef Vikas Khanna and Chef Kunal Kapoor was for chicken tikka masala but I made a vegetarian version of it. Also I tweaked the recipe a little based on the availability of ingredients in my kitchen. Like, the recipe called for 1 cup tomato puree + 1 chopped fresh tomato but I didn’t have tomato puree so I used 4 fresh tomatoes in stead. Tip: If you want that bright orange color like the one you get in restaurants, you can add some food color. You can also add 1/2 teaspoon of paprika powder to the curry for a deep red/orange color. 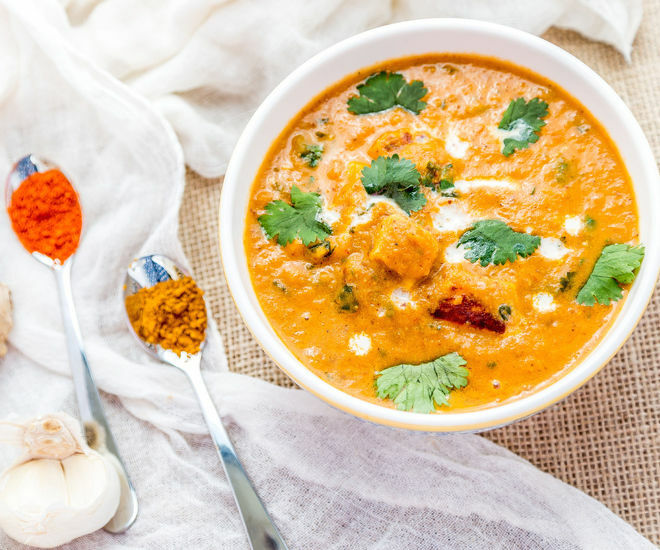 So let’s see how to make this delicious paneer tikka masala. Cut the paneer into small cubes or in any size you like. My hubby likes eating small paneer pieces so I chop them small : ) . Next add in the chopped ginger, garlic, coriander powder, garam masala powder, paprika powder, salt and red chilli powder. Add in the yogurt and mix till all the paneer pieces are well coated with the spices and yogurt. Cover and keep this marinated paneer in the refrigerator for 30-40 minutes. Ideally you should keep this marinated paneer in the fridge overnight but if that’s not possible than minimum of 30 minutes is must. Use thick curd or preferably hung curd to marinate the paneer. To make hung curd, tie the curd in a muslin cloth and let it hand for 3-4 hours. Once all the water from the curd has dried out, your hung curd is ready. So while the paneer pieces are in the refrigerator, we will make the curry for the paneer tikka. Heat 1 tbsp of butter and 1 tbsp of oil in a pan. Once hot add cinnamon stick and cumin seeds. Once the seeds crackle, add the chopped onions, crushed garlic pods and chopped ginger. Fry until the onions turn golden brown in color. Once onions are done, add the tomatoes and the curry powder and mix. Also add the the salt and sugar. Cook the tomatoes on medium flame till they are soft, around 6-7 minutes. You can use also store bought tomato puree here. Once the mixture is cooked, switch off the flame and allow it to cool a bit. Pour the mixture into a blender and puree it. Set aside. Take out the marinated paneer and roast it on a pan, you can use little oil or roast as it is. In few minutes, the paneer pieces will turn brown in color, switch off the flame and set them aside. In another pan pour the purred tomato-onion mixture and add a cup of water. You can adjust the amount of water you want to add here. 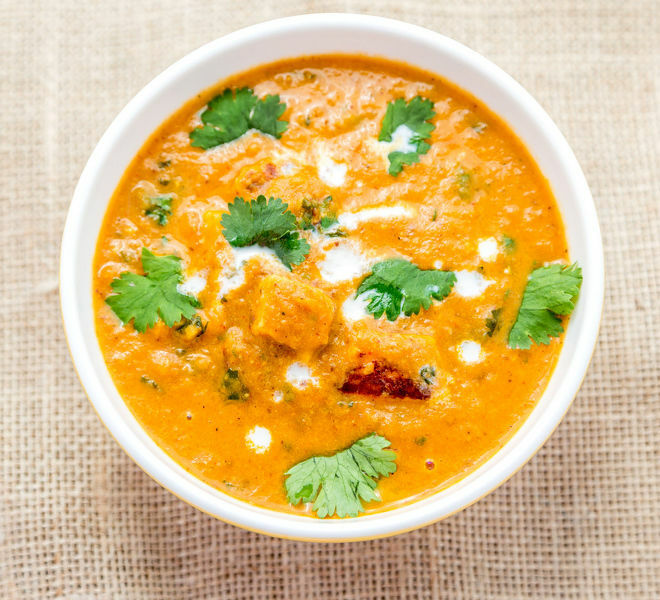 Add chopped coriander leaves and cream to the masala and let it cook for 4-5 minutes on medium-low flame. Then add the roasted paneer pieces. Give it a final stir, cover and cook for additional 2-3 minutes. Garnish with coriander leaves and switch off the flame. Serve hot with butter naan or any bread of your choice. 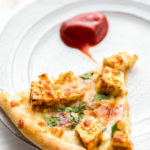 Paneer Tikka Masala - Spiced paneer (Indian cottage cheese) tikka in onion and tomato based curry. 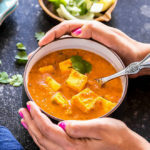 Cut the paneer into small cubes, add in the chopped ginger, garlic, coriander powder, garam masala powder, paprika powder, salt and red chilli powder. Add in the yogurt and mix till all the paneer pieces are well coated with the spices and yogurt. Cover and keep this marinated paneer in the refrigerator for 30-40 minutes. Heat 1 tbsp of butter and 1 tbsp of oil in a pan. Once hot add cinnamon stick and cumin seeds. Once the seeds crackle, add the chopped onions, crushed garlic pods and chopped ginger. Fry till onions turn golden brown in color. Once onions are done, add the tomatoes and the curry powder and mix. Also add the the salt and sugar. Cook the tomatoes on medium flame till they are soft, around 6-7 minutes. Once the mixture is cooked, switch off the flame and allow it to cool a bit. Pour the mixture into a blender and puree it. Set aside. Roast the marinated paneer till golden brown in color from both sides. Pour the pureed masala in a wok/kadhai and add water to it. Stir and add cream and chopped coriander leaves. Cover and cook for 4-5 minutes on medium-low flame. Add the roasted paneer pieces, let it simmer for 2-3 minutes. Switch off the flame and garnish with chopped coriander leaves and cream. Use 1/2 teaspoon paprika powder in the curry for a deep red/orange color. I used paprika powder while marinating the paneer but forgot to add in the curry. 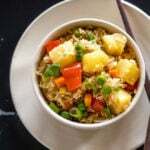 For a vegan version, you can skip the butter and cream and use tofu in place of paneer. 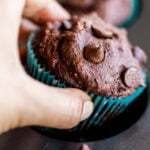 The quantity of butter and cream in the recipe depends on your taste and preference. The original recipe had an additional tablespoon of butter which I didn't add. The paneer should ideally by grilled so in case you have a griller use that to make the tikka. You can also drizzle around 1/2 teaspoon of lemon juice on the curry once it's done. If you want, you can strain the pureed mixture before putting it back in the pan. This will just make the curry totally smooth. Hi manali..whan can i use instead of tomatoes or tomato puree..coz tomatoes are restricted to my husband…can i use dry mango powder instead.. It was really delicious. However I did use the puree and 1 can of chopped tomatoes. Also–what do you mean by “roast” the paneer? I ended up doing it in a frying pan and it did turn out fine but perhaps there is a better method?? Thanks for a great recipe. I am a novice in the kitchen. You made this look easy with your instructions – gave it a try and it worked out great! Thank you. I am glad it turned out well! You are welcome! I have made tikka masala before but never with paneer. I love this idea and must make it! Thanks for a great recipe! I used Tofu instead of Paneer and guess what it turned out awesome! My family loved it especially my girls who are 5 and 2.5 years, so yes a definite thumbs up to to your recipe. This was delicious! 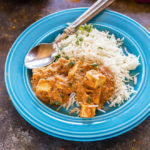 I made my own paneer and this curry was fantastic for it. Thanks so much! Do you blend the whole cinnamon stick too? Awesome! Thank you. Trying this tonight! what do you use to blend all your spices and onions/tomatoes, etc to make it so smooth? Do you have a particular blender that you use? My kitchen appliances always leave chunks of ginger or whatever I’m blended and never as smooth looking as yours. To get it very smooth, you need a high speed blender. Any good one would do, I have blendtec. So yummy! My family loved it! I have made this 6 times and also for my daughter ( who has a new baby) who needed a showstopper meal for a dinner party…it was a hit with the vegetarians and the non-vegetarians! Made a separate meal with cubed chicken ( marinated and roasted the same way) and equally as good. Tonight I am trying coconut milk…It’s almost ready!! Thank you for a perfectly described recipe! So delicious every time. My family can never have enough curry bad this is just the most perfect side dish or even main course. Absolutely love it. I am so glad to hear that Anezka! 🙂 you have a beautiful name btw! Hello Manali, I’d like to make my own curry powder. Do you have a recipe that you favor? Thanks! Hello Lee, I don’t have a recipe for homemade curry powder on the blog yet. But I will definitely try to share one sometime! Made this this evening. Was amazing. Very tasty and yummy. My boyfriend gave it 11/10. I followed the recipe exactly and it turned out spectacular. Thank you!!! Just a note unrelated to the recipe. 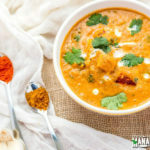 Tikka masala ia not an original Indian dish – it is a british invention. Yes Rahul, I am aware.. I am planning to make this over the weekend. I have yet to make an even decent tikka masala recipe but the comments give me hope. Only question, is this very spicy? I love the flavors but we like quite a bit of spice. Suggestions? It is not spicy but very flavorful! If you like a lot of heat add more of red chili powder/cayenne pepper while marinating the paneer..maybe 1 teaspoon in place of 1/4? Also you can red chili powder to the curry as well. It’s totally up to you. Hope this helps! What is curry powder? Curry leaves powder ? Hi Kavya, curry powder is a spice mix which is popular in the western world. 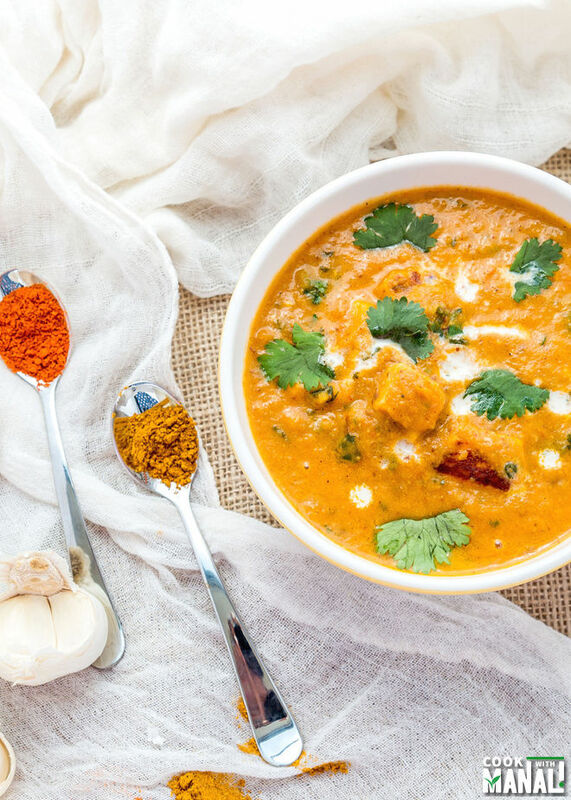 Since tikka masala has it’s origin from Britain, they used curry powder to make it. You can find it on amazon: https://www.amazon.com/Simply-Organic-Powder-Certified-3-Ounce/dp/B00269PM6K/ref=sr_1_12_s_f_it?ie=UTF8&qid=1546103090&sr=8-12&ppw=fresh&keywords=curry+powder It’s basically a mix of coriander, cumin, turmeric etc. I never write reviews for recipes, but I am making an exception for this one. We doubled the recipe (tripling the amount of paneer) and have been eating it for a few days, and the longer it sits the better it tastes. It was super simple and flavorful. You can heat up leftovers in the microwave. We didn’t have cumin seeds, so we used the powder. We used greek yogurt for the tikka (a single-serve cup of plain store brand for like 80 cents). We also added cilantro paste during the onion sauteeing step. We didn’t measure anything and just eyeballed amounts based on the pictures. I think we paid around $20 for the ingredients including rice and naan bread (we already had all of the spices and the paneer was the most expensive at $10.98 for 2 packages), and got 5 days worth of dinner. We will be making it again. Easy to make and delicious – thanks for sharing.